Mo So is a lim estone mountain range in Kien Giang Province’s Kien Giang Town which is famous for Hang Pagoda, Phu Tu Islet, Thach Cave and Da Dung Islet. 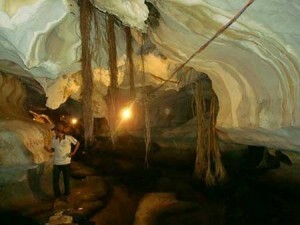 However, one often overlooked spot is Mo So, which is recommended as an attraction for travelers who are brave enough to journey into its mysterious caves. The road to Mo So from Kien Giang Town entertains visitors with its shining golden rice fields and windy limestone mountains. Like other mountains, Mo So is endowed with many caves which used to be military bases in wartime. The first stop is Quan Y (army medical corps) Cave which is 300 meters long. The cave lures tourists by small wooden bridges, soil bags functioning as paths for travelers to step on, tiny gloomy lakes as well as its many bats. Colorful lights beaming on rock walls arouse imagination for visitors. You can see a dolphin leaning its mouth to the cave’s heart, a white dragon soaring on the clouds or a Buddhist hand. Knocking on that hand, visitors will be startled by rock melodies echoing on the mountain walls. After some distance the cave comes to light by glistening sun rays over wild flowers and green moss hanging on the wall and on stalactites. Water drops from the gate fulfill the gorgeous setting. Moving from Quan Y to Voi Rong Cave, you will see nature in its glory. Touring to Mo So, tourists should not forget to admire a valley which is about 700 square meters and about 20 meters above sea level. Standing amidst the valley, tourists will be amazed by the clouds around, the whistle of winds and blue streams through rocks. In the rainy season, tourists can take a boat cruise around the attraction to get lost in one of the riddles of nature.